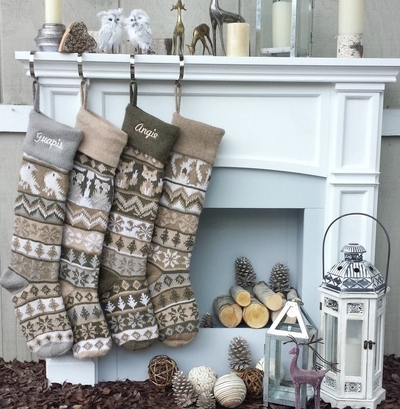 28 INCH LARGE Knit Fair Isle Christmas Stockings in Modern Cream Beige Grey Color Tones! Our very BEST and the most luxurious knitted stockings are sure to take your Christmas decor to a new level. They are very large - long stockings, fit for lots of stocking stuffers. These retail at $50 unpersonalized in the finest stores, so "get-em" while they last. And yes, personalization or monogram is free! Choice of different designs so you can make a set. NEW for 2017 - We have added a new "Snowflake" design to this collection. SEE ADDITIONAL IMAGES. The listing and price is for ONE STOCKING. We are showing set stockings hanging together in a group so you can envision what a set would look like when you choose some of different colors. We have a sample picture of the stocking set monogrammed with embroidery thread ... click on the thumbnail image in the top right hand corner of this page to see a larger version. For group orders of 2 or more stockings, we will do our best to adjust the font size of the letters so the monogrammed letters are uniform in size. For example, if your order has the names Mom, Dad and Christopher , we will embroider the longest name first and then adjust the font size of the shorter names to match the font size of the longest name, otherwise the shorter names will appear to be disproportionately large. If you want the largest letters available monogrammed on the cuff, please specify SHORT versions of names, such as Mom/Dad/Chris instead of Mom/Dad/Christopher .